An interesting conversation came up at the Holly RECREATION 101 Hikes. Women, hiking the trails of our local Parks. Not just alone, but even in small groups. It was told to me how unsafe most women feel when hiking many of the local trails. Many have even felt un-safe while riding their bikes on some of the Pathway systems. I was appalled by these comments. I guess I have never realized just how deep the safety issue went, with women in the outdoors. As a male, I have always just got in my car, went to where ever I wanted to go, and headed into the woods;. Bushwhacking or trailing. And it never mattered to me whether I was alone or with a partner or not. I guess I have taken this ease of outdoor access, for granted. It is definitely not what most women can do, or will do. The solice and quiet I have experienced while being alone by a stream or overlooking a pond on a hillside, have been defining moments in my life. The solitude has allowed me to think about personal problems or just relax to a point I cannot achieve in any other way. I realized for the first time on our Hike, that most women have not experienced this. Even when they have headed out either alone or with another female partner, they have felt a security issue. There watching, safety issues and many other things that all take away from the very things I have gone to remote places in our parks to achieve. And f I feel this is unacceptable for women. On the HM Facebook page and our Bulletin Board, we have been asking for ideas and suggestions on ho we can better these situations for women in the outdoors. There have been some great ideas and suggestions for safety, posted on this on-line portals. But there needs to be even more. Look for an upcoming Hike that will address this very issue of not only safety for women in the outdoors, but something even better then that. A women’s chance to actually feel the calm, beauty and nurturing qualities of Nature, without the fear for her safety. Let us know how you feel about this, or if you have any suggestions. We have been following one specific nest at the Holland Ponds, Heron Rookery, in Shelby Twp. Out of the almost 50 pairs of great Blue Herons nesting here for 2011, we have selected one nest to watch and follow through the season. So far, this nest has produced two healthy youngsters. Most Herons produce two or three youngsters a nesting season. Once hatched, the youngsters grow at an amazing rate. Which means both heron parents spend most of every day, taking turns in going hunting and bring food back to the nest. One adult stays with the chicks, while the other fetches food. And so it goes, all day, every day, until the chicks are fledged from the nest. Because of the lack of funding for the whole parks and waterway systems in our state, the DNR will not be doing much for trails maintenance this year. We are all hoping that the new PASSPORT license plate program will change all of that by the end of this year. Hopefully heading into 2012, the funds will start to return in maintaining and improving all our parks and waterways in Michigan. Everyone needs to participate in the new PASSPORT program. In the meantime, how about HM members doing some paybacks to all the S.E. Michigan State parks that have done us so well these years in Hiking. Many of the park supervisors and staff have accommodated our group in so many ways. For this reason alone, I feel personally beholding. BUT……on even a bigger reason, it would feel real good to give back to the natural environments that have given so much to all of us and our State. May I suggest that we start a Trails maintenance program here at Hiking Michigan. Starting this spring, we can plan specific Hikes that would include trimming overhanging branches and foliage from the trails, while we do a Hike on one of the trail loops. No heavy physical labor, just some trimming as we go. We can learn something about different plants, how to maintain a trail, water drainage and possibly on occasion, get one of the Park staff to inform us even more about the various aspects of trails, their maintenance, and some of the plant and animal lives they affect. Hiking Michigan will supply a hearty Lunch around a campfire for each Trails Help Hike that we do. A great way to have some fun hiking, get some fulfillment at helping our parks and trails, and of course have some good chow around a campfire together. 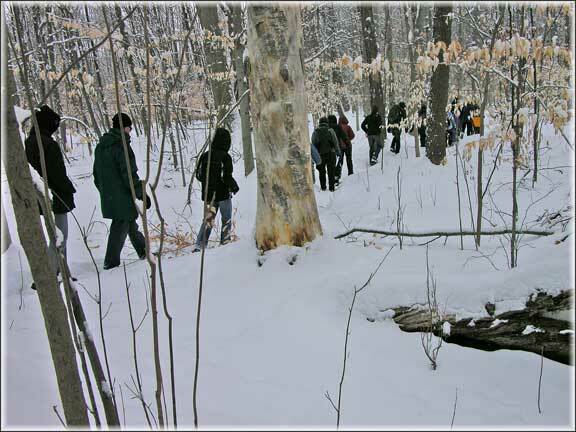 We had over 30 hikers show up for our Michigan Nature Association hike at their new Nature Preserve, out at the Wilcox-Warnes Nature Sanctuary. It had snowed almost 3 inches the night before, so there was a nice covering of snow everywhere. Kathrine from the MNA was there in answer questions, along with Martha and other MNA personal. Mike led the way in his snow shoes, to pack down the snow a bit for the rest of us. This worked out well, with the freshly fallen snow. It was beautiful out in the woods in the fresh snow. We discovered a large area of Turkey tracks. The local clock had already been out that morning foraging around. We stopped by a Great Horned owl’s nest, but no one was home. 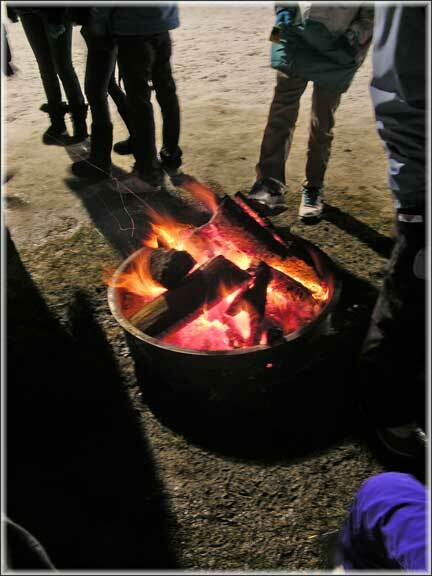 After the Hike, a few of us went over to near by Rochester, for the FIRE & ICE Festival. 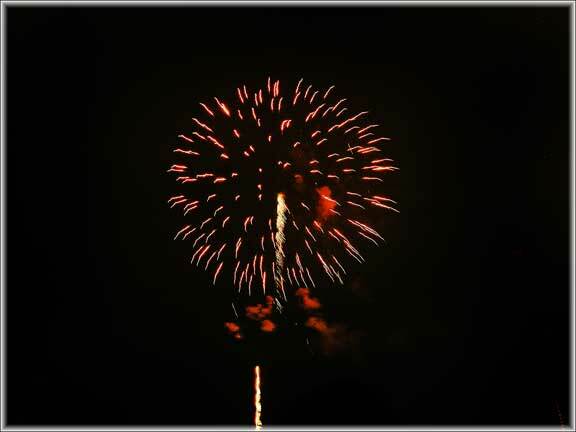 Ice sculptures, Snow shoeing, Food and Fireworks where just some of the activities there. An excellent winter day! We asked all of you hikers, bikers, and horseman about the trail systems in our State parks. Got lots of responses both on Facebook and through emails. There where many different ideas and feelings on sharing trails with different User groups. Many thought that the trails should be divided into individual trails for each User group. Unfortunately this leads to so much dissecting of the natural environment, that the nature experience is lost. Pontiac Lake Recreation area is a good example of individual trails for each User group, and a very dissected natural environment, in the main part of the park.Many people suggested not mixing Bikes with Hikers or Bikes with Horses. That is possible in some parks, where there is enough wide open spaces to accommodate many different trail systems. 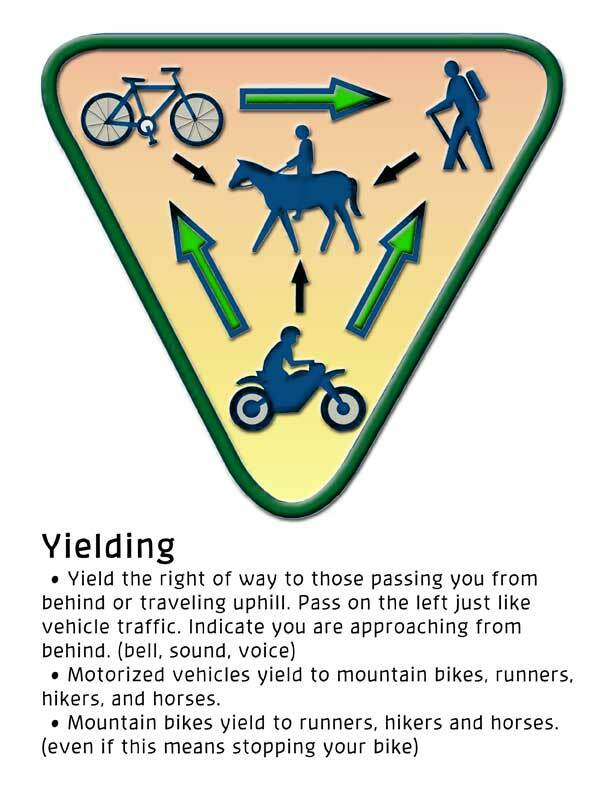 Many responded that with proper rules, that some trails could be shared between hikers and bikers, and the horses should be left to their own trail systems.Yet others that only hike said that sharing trails with bikers spoiled their nature experience as bikers came zooming past them on the trails. Probably the most universal thread was that with common courtesy and sense, that most trails could be shared by many different User groups. It seems the rules and common knowledge of passing and stepping off the trail for others are not as common knowledge as we all think. These are not easy questions to answer, nor are they easy problems to solve. The bottom line will always be the Natural resources and environment that needs to be considered first. 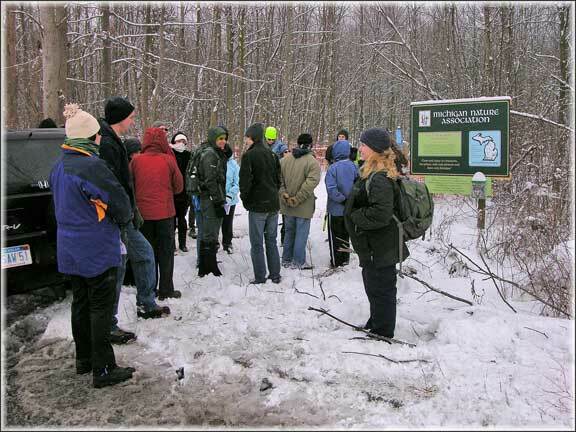 Almost all User groups come to a State Park because of the natural environments there. Loosing them would mean losing the reasons for even using the trails in most cases. Thanks for participating in the Poll. I learned alot, and will be taking this to the State Trails Advisory Committee meeting in March. The DNR is working very hard on how to handle the many different User groups and individuals who want to enjoy our State Park Trails and natural environments. It is not always as simple as installing another trail, for another group. And there is not always the room for every kind of use a small Park can accommodate. 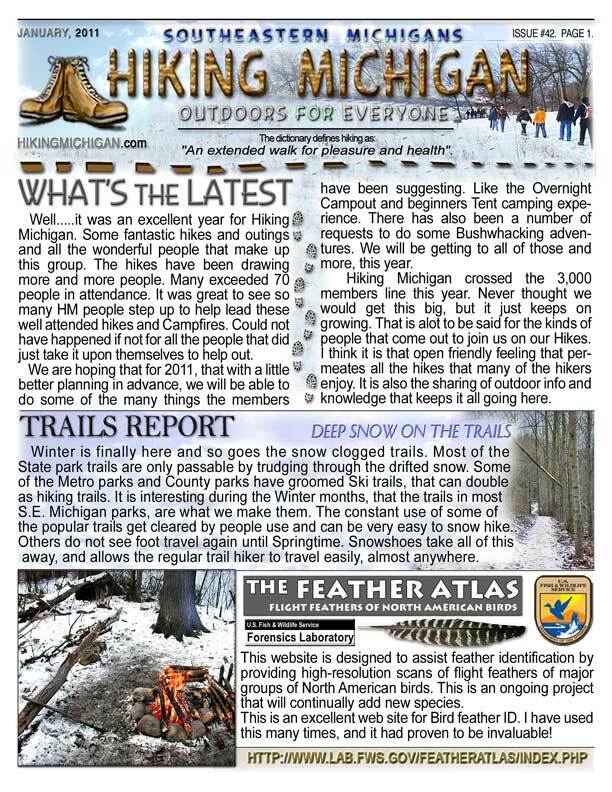 The Hiking Michigan Christmas newsletter is online and ready to read or download. We hope you enjoy this issue.